A Swedish court has sentenced a Uighur refugee to 16 months in prison for spying on Uighur expatriates for China. Babur Maihesuti, 62, was found guilty of passing on personal details, including political activity, of other Uighurs to a Chinese agent. The court said he had infiltrated the World Uighur Congress, a political body for exiled Uighurs. Nearly 200 people were killed last July in riots in north-west China between Uighurs and China's majority Han. 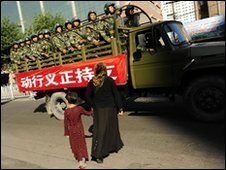 Uighurs are a Turkic-speaking, mainly-Muslim people living in north-west China's Xinjiang region. Many complain of religious, cultural and political oppression. The court in Stockholm found that from January 2008 to June 2009 Maihesuti had collected information about other Uighurs and passed it on to a Chinese spy posing as a diplomat and journalist. "The crime is especially serious because the intelligence served a superpower which does not have full respect for human rights," the Stockholm district court said in a statement. The court said it based its verdict on "strong" prosecution evidence including wire-tapped telephone conversations and interviews with Uighur witnesses.